Winter will be a little warmer this season thanks to Alexa Hough and Sofia Coppola, third graders who decided to help others by collecting coats at Link Elementary School in New City. 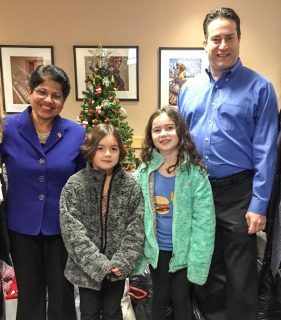 The 8-year-olds, accompanied by their mothers, Amy Hough and Ali Coppola, as well as Sofia’s brother, Colin, 11, personally delivered their massive collection of clothing to the Rockland County Legislature’s offices today. They donated their collection to the 2016 Winter Coat Drive conducted by Legislators Aney Paul and Alden Wolfe. “We wanted to help people who didn’t have coats,” Alexa said. The students said they, their parents and their school were surprised by the generous donations they received. They visited every classroom and talked about their project and made fliers and even a collection box. “I made the sign for it,” Sofia said. After being encouraged by their school to pick a student action project, the girls decided to conduct their own drive and donate the collection to the Legislature’s Winter Coat Drive, which benefits People to People. People to People is Rockland’s largest food pantry and also provides school supplies; holiday gifts for children; and clothing for newborns, school children, professionals seeking jobs and others. The agency helped nearly 14,000 Rockland households last year. The Legislature’s Winter Coat Drive, which ended last week, brought in scores of new and gently-used coats and other warm clothing donated.